I love an old school type antipasto salad. There’s nothing overly fancy about these types of things but they do have some distinct characteristics, a bright, vinegary dressing being the biggest. A sturdy lettuce is key as are a lot of vaguely “Italian” ingredients – salami, cheese, peppers – along with an underipe tomato and thin slices of red onion. Don’t get me wrong, a ripe tomato would be wonderful I just don’t know that I’ve ever had one in this sense. There’s a lot of “stuff” but more what I would consider a carefully curated list of “stuff”. A salad with a lot of stuff is my kind of salad. Don’t try to convince me that the last bite, where all the good bits meld and mingle, isn’t the best bite. You have to think about how you build this thing. My favorite restaurant serves their version in a bowl, with slices of the cheese and salami lining the bottom and the salad fixings piled on top. The advantage to this method is the dressing sinks down to the bottom of the bowl and coats the meats and cheeses quite nicely. That’s one way to go. Another way is to cut everything into chunks and toss it all together and that’s the direction I’m going here, mainly because I can sit on the couch and easily eat the thing while watching college tournament basketball, no knife needed. These things are important. Lettuce: of course you need lettuce. It’s a salad. Iceberg would be traditional and is wonderfully crunchy and refreshing but romaine is usually my default. A mix of the two is nice – a bit of both worlds. Vegetables: a slightly underipe tomato is par for the course, cut into nice big chunks as is a thinly sliced red onion. Cucumber would be ok but don’t go too crazy on the vegetables. 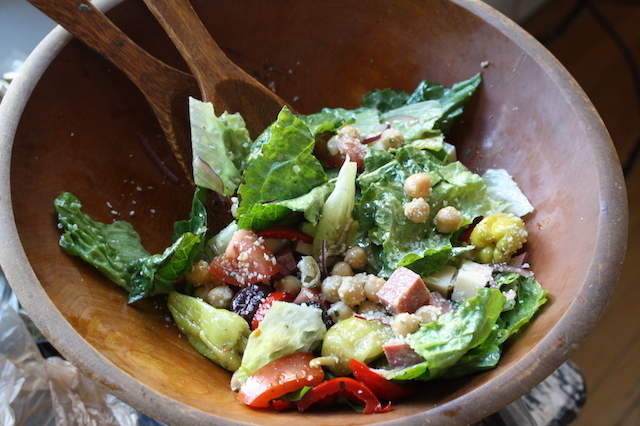 Keep them to a modest level – too many and you’ll have a different salad. Cheese: To slice or chunk is up to you. Provolone is a must in my opinion, and an aged one is ideal. Cubes of asiago would be good too. Mozzarella would work, but choose a firmer one and know that it won’t add all that much flavor. For ease, buy cheeses in ½” thick chunks at the deli counter if you’re going the cube route. I also like to add a good handful of grated parmesan at the end. Salami: this is an absolute must as it is my favorite part. I prefer a hard salami though a Genoa works. The herb or pepper crusted versions are quite nice if you’re looking for something fancier. Mortadella, capicola or even pepperoni would also be good in addition to, but not in place of, the salami. Hard salami is non-negotiable. Again, hit the deli counter. Peppers: one must absolutely have peppers. Pepperocini, certainly, but also a red pepper of some sort. Roasted red peppers are standard but I’ve been using sliced pepperdew peppers to great success. If you only need a few peppers and don’t want to buy a whole jar that will sit in your fridge for months, check out the salad or olive bars at your grocery store and just buy what you need. 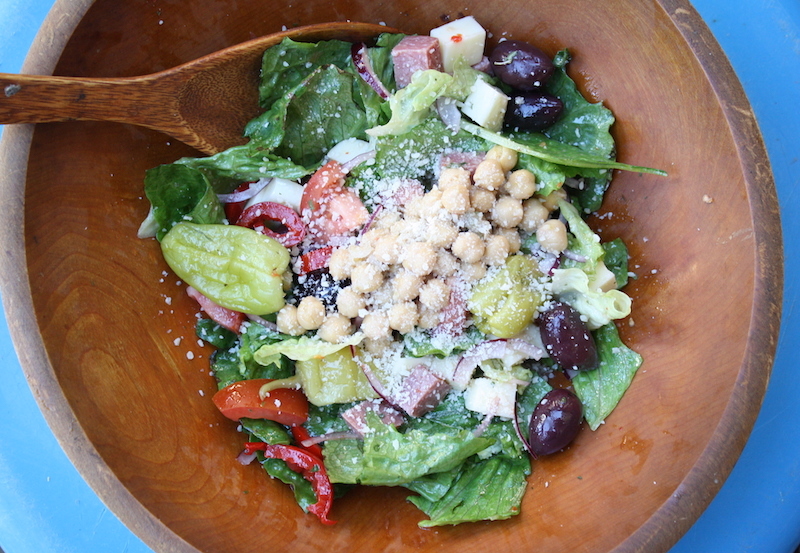 Olives: again, a must. The ubiquitous California black olive would be appropriate here, especially if you went the iceberg route. I tend to pick up a few Greek types at the olive bar, as they’re more flavorful. Dressing: Italian obviously. It should be punchy from the vinegar and heavy on the oregano. Though not traditional, I add a small bit of mustard to help it stay emulsified. Some like a pinch of sugar (not me) but I’ll leave that up to you. Make the dressing at least a few hours ahead to let the flavors meld. Any extras will hold in the fridge for at least a week. Optional additions: try not to go overboard. This is not really a toss-everything-in-the-bowl kind of thing but a handful or two of garbanzo beans, tossed with a little of the dressing, is quite nice. I might allow a few marinated artichoke hearts too but that’s getting really fancy. Maybe, if it needs to be used, a few of those jarred Italian style picked vegetables – cherry peppers, cauliflower, maybe the carrots. Maybe even a spoonful or two of giardinara. Again, don’t go too crazy. Once you’ve got everything together, it’s go time. Take care when dressing – it’s easier to add more dressing than to deal with an overdressed, soggy salad. I also like to add half the ingredients to the lettuce and toss then the second half on top, as all the good stuff tends to sink during tossing. If you don’t mind digging for the bottom, throw it all in at once and go. STRESS THERAPY BAKING FACTOR: OLD SCHOOL COMFORTS. I’ve always loved this type of salad with its mix of meats and cheeses and salad-y things, all slicked with a puckery dressing. How can you possibly eat a plate of chicken parmesan or spaghetti and meatballs without this to start? I just don’t think it’s possible. And while I have my favorite combinations (ahem, see below), I will pretty much eat any combination of meat-cheese-pickled things with some crunchy lettuce. This much I know is true. You can prep all the ingredients ahead of time but toss everything with the dressing just before serving. 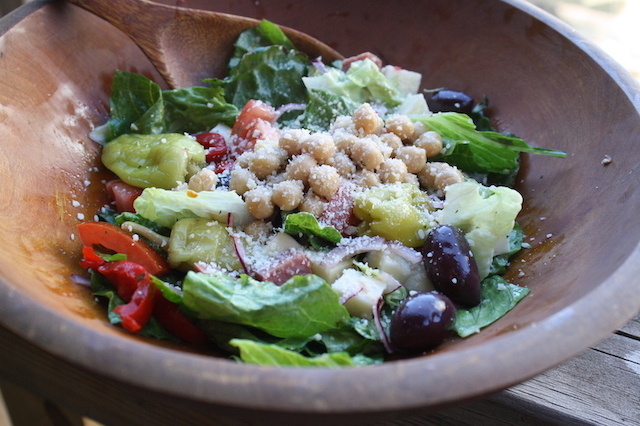 If you prefer to use sliced meats and cheeses, line the serving bowl first then build the salad on top. Mix and match your salad ingredients based on what you have and what you like; below are my suggestions. For the dressing: Combine all ingredients except for the olive oil in jar with a tight fitting lid. Shake to combine. Add the olive oil and shake to combine. For the salad: cut or tear the lettuce, wash and dry well. Place the lettuce in a large shallow bowl. Drizzle with a few Tablespoons of the dressing and toss to coat. Take care not to overdress – it’s easier to add more dressing than to deal with a soggy salad. 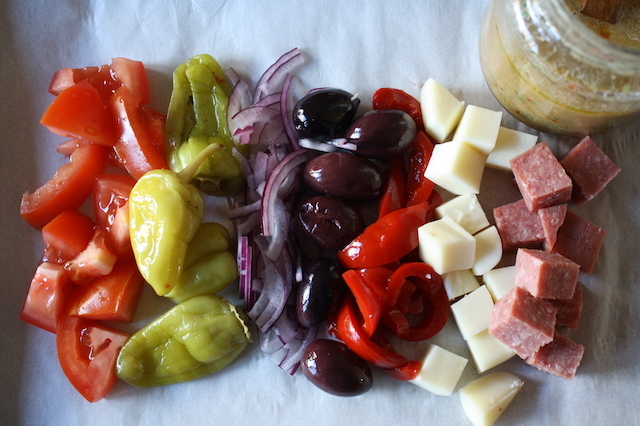 Add the remaining tomatoes, pepperocini, olives, peppers, onion, provolone and salami and drizzle with a bit more dressing. Top with the dressed chickpeas and a handful of parmesan and serve immediately.